Get notfied by email when there are news here. Let's see if we revive a Facebook page for the program. Feel welcome to participate and share your photos. Faster!, now the program uses multiple processors if available in its operations. New version 4.0 with a new interface and all the effects at hand, easily navigable in a single column. February 7, 2009: PhotoChandes LAB and Plugin in a single product. PhotoChances LAB and Plugin have been merged in a single product (PhotoChances LAB) that will install optionally the plugin. Version 3.7 includes predefined standard crop ratios. Option to reset effect leaving the image being controlloed only with the postprocess controls. 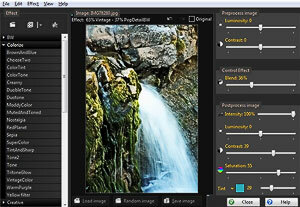 All the effects and the significant features of the LAB module in a PhotoShop plugin. With it you can invoke easily the effects directly from PhotoShop and finetune them at will. Undo/Redo now take into account crops and rotations. Load images randomly: Holding down the Alt key while pressing the Load Image button will load an image randomly choosen in the folder or collection of folders set the settings. Try this for some fun: Run PhotoChances LAB, load any image (with the button "Load image" and load some effect (for example try a new one, in the store of recipes look in Paint and choose Comic-Hero. Now hold down the Alt key and go clicking Load Image and you will see your images with that effect. June 2008: New Version 3. PhotoChances split in two products, "Explorer" and "Lab"
Now PhotoChances can be acquired in two independent products. PhotoChances Explorer is the slideshow of the photographs running randomly with random effects. PhotoChances Lab allows loading the effects in an image and applying them to any other image. It also has a collection of assorted effects to use immediately and the Random effect button that generates new renditions of the picture on the fly. New recipes and refinded old ones. New moderated black and white Acutance. And four new ones named HiRange producing HDR style effects. A "Random recipe" button in the Lab window, will generate instant recipes. Added keyboard shortcuts to each option in Settings: Pressing the first letter of each tab will access that tab, for example pressing E will open "Effects"
New family of effects "Paint", produce oil paitings of the images that look very nice on the screen and especially printed. New recipes/effects: BoostBlack, LiftBlack, TintShades and Vintage. Sepia added to the store of recipes. New program Icon. New base image of recipes. Performance in some areas improved and bugs fixed. The Lab window has features for storing favorite recipes for quick access.